Hamburger Steak. Top Meat Dish of the World. Hamburger steak must be the most popular meat in use the world round. 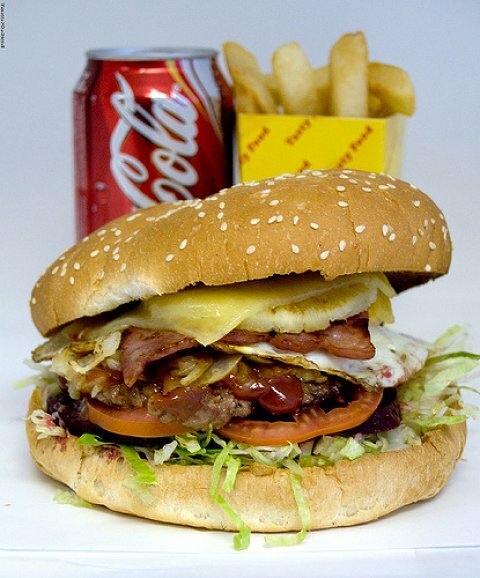 Just think of how many different fast food outlets that owe their existence to the hamburger. Let alone the millions who cook their own at home or at the campground. There are an amazing numbers of recipes on line for information on how to cook steak, or how to cook asparagus or how to cook chicken, but the number one most popular recipes are those relating to the lowly hamburger. Here is a wonderful recipe with blue cheese, mushrooms and onions resulting in a great juicy hamburger. In medium bowl stir together ground beef, ¼ teaspoon salt and pepper. Form into 8 large ¼ inch thick patties. In a small bowl stir together blue cheese, cream cheese and mustard. Place about two tablespoons of cheese mixture on top of each of four patties. Top each with the four remaining patties. Press around the edges to seal. Place hamburgers in a 10 inch skillet. Cook over medium heat, turning once, until desired doneness (12 to 15 minutes for medium). Place hamburgers on buns. In same skillet with drippings place mushrooms and onions; add ¼ teaspoon salt and pepper and Worcestershire sauce. Cook over medium high heat, stirring occasionally, until tender (4 to 5 minutes). Meanwhile place a tomato slice on each hamburger; top with grilled mushrooms and onions. Assemble as directed above. Place hamburgers on microwave-safe bacon/roasting rack or 12 X 8 inch baking dish. Cover; microwave on high, turning hamburgers over and rearranging after half the time, until desired doneness (5 to 8 minutes for medium). In a medium bowl combine remaining ingredients except the buns and tomatoes. Cover; microwave on high until crisply tender (2 to 3 minutes). Assemble the hamburger steak sandwiches as directed above. Italian beef recipes and ground beef chili and crock pot beef stew are three recipes that go over big in our house. Easy to make and everyone wants more. We grew up dining on corned beef recipes and old fashioned beef stew. My mother had a great pork loin roast recipe that was mouth watering. Pork rib recipes are easy to produce as well as pork chops slow cooker meals.